“The good weather of the last week has ushered in honey bee swarm season. What that means is when a hive is getting really full of bees in the spring, which is a good sign that they are happy and healthy, the bees start making new daughter queens, to send off with swarms of bees. 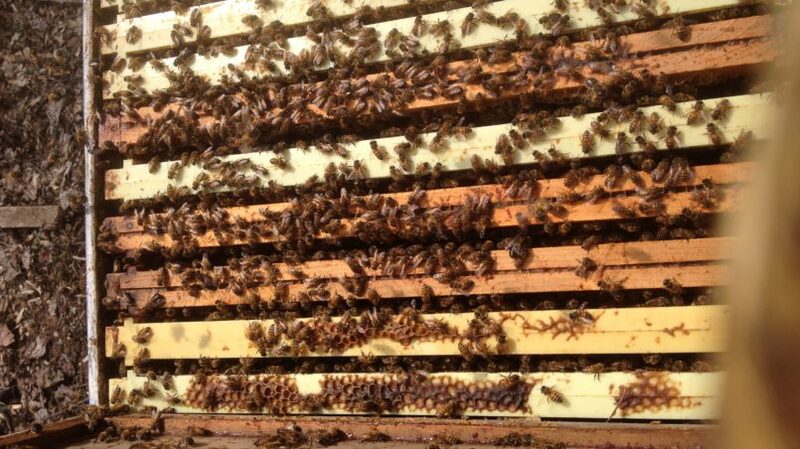 I’m including a photo below that shows a hive with a reasonably good population for March 25th, when it hadn’t really gotten warm yet. Swarming is how honey bee colonies reproduce themselves in the wild. They send off the old queen with about half of the hive to find a new place to nest. Sometimes they will send a secondary daughter queen out with another 25% of your hive. For a beekeeper, swarms are both a blessing and a curse. On the plus side, it means your hives came through winter healthy and strong enough to reproduce. More bees = more honey. On the minus side, if swarms aren’t properly managed, 75% of your bees can fly off into a nearby tree that is not within your reach. See photo below. Then, as a beekeeper you have far fewer bees in your hive to gather nectar for honey, and since bees don’t live in the wild in our part of the country, the swarms will most likely die over winter. Sad. So, what I have been up to this last week is checking on all of my hives looking for the presence of what are called swarm cells. They look kind of like peanuts hanging off the edge of the comb. See below. In the swarm cell there is a new virgin queen who will hatch in about 5 days. Once the new queen, or queens, are hatched, the bees may fly off at any minute, and possibly take your good queen with them. In choosing the bees for your colony, I took bees from my colony that has shown signs of wanting to swarm. This way, I am taking away half of their population and the queen, which will ease their over-crowding problems and hopefully discourage them from swarming. Basically, I am manually pre-swarming them and putting them in a hive. They get nice new digs, and I get to keep my bees (win, win). Plus, I am assured that you will be getting a proven queen, who is already laying well and is a winter survivor. 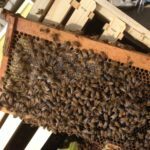 Winter survival is the most vital trait that queen breeders are looking for, and by spreading good genetics into your area, I can hopefully help improve the general stock of bees that are out there looking to mate. This plan allows me to work with bees’ natural instincts to increase the number of hives I manage – which works most of the time.